The Festival Tea Garden features coffee, herbal & black teas, and hot cocoa donated by Equal Exchange Espresso, and desserts from great Ballard businesses. Good news! 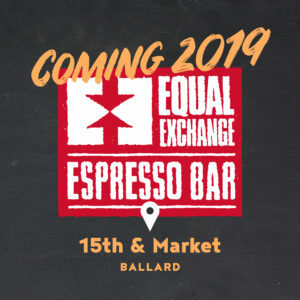 — Equal Exchange will return to our neighborhood next spring in the new building on the northeast corner of 15th & Market! For just a $5 donation, participants will choose tea, coffee or hot cocoa along with two dessert samples (or $2 for a beverage only). Your donation supports Sustainable Ballard programs. The Tea Garden features whimsical garden art with tables and chairs nearby to rest from the festival. Thank you to these Ballard businesses for donation deliciousness for the Tea Garden! Equal Exchange Espresso – Equal Exchange is a for-profit Fairtrade worker-owned, cooperative headquartered in West Bridgewater, Massachusetts. Equal Exchange distributes organic, gourmet coffee, tea, sugar, bananas, avocados, cocoa, and chocolate bars produced by farmer cooperatives in Latin America, Africa and Asia. Cupcakes by Cupcake Royale – Cupcake Royale was founded in 2003 as Seattle’s first cupcake bakery and café. In fact, Cupcake Royale is the nation’s first cupcake bakery to open outside of NYC! They are committed to giving back to our community and annually donate over 40,000 cupcakes to help raise funds for local non-profits — like us! They care deeply about baking delicious cupcakes, crafting amazing espresso, and creating sustainable communities and joyous experiences. Donuts by Top Pot – Begun in February 2002 out of a small brick storefront on north Capitol Hill, Top Pot paired a vintage aesthetic with a gourmet spin on the traditional coffee and doughnuts pairing. They take great pride in (and have a lot of fun with) elevating the humble doughnut to an art form. They call their doughnuts “hand-forged” because they’re made the old-fashioned way. As a result the unique characteristics of each doughnut are preserved by their skilled bakers. Caramels by Jon Boy – Jonboy Caramels is an artisan confectionery company based in the Ballard neighborhood. In 2009, Jon Sue and Jason Alm came together with the idea of making the finest small batch caramels using the very best ingredients available. Local cream and butter, paired with ingredients grown and produced close to home, come together to make the finest textured and tasting caramels out there.